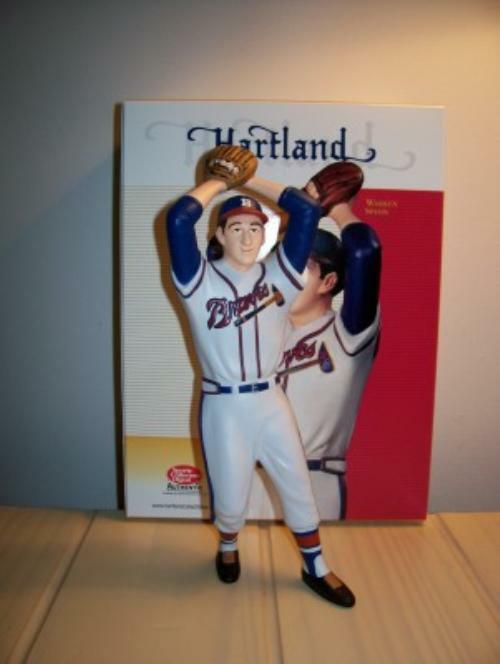 Warren Spahn Boston Braves Hartland Statue! Your Opportunity To Own A Moving Hartland Tribute to Warren Spahn! The Hartland legacy is one of the oldest in the hobby! Originally sold at stadiums in the early 1960s, the original statues sold for just a few dollars each. Hartlands are the first statues ever made in the figurine market! With a lasting legacy of over 40 years, Hartland continues to make some of the finest figurines in the market today! Don't miss your opportunity to own this moving tribute to Warren Spahn. Don't delay! Here's your chance to own it at less than half the original retail price of $50! Hartland is sold out so don't delay! Orders will ship priority mail unless package is over 4 pounds or 36 inches. If larger, it will ship parcel post. We accept VISA, MC, AMEX, and DISCOVER. We accept PayPal as well. Please call us at (703)728-8881 with any questions. Shipping and handling is a fixed fee of $8.00 for US shipping only. Please note that shipping and handling includes the costs of the box, packing peanuts/materials, labor. We charge a FLAT fee for shipping. We ship US Priority Mail and US Parcel Mail depending on the size of the box. International shipping is determined on an individual country/order basis. Orders may take up to 3 to 5 business days to ship once payment is received. Our return policy is that buyer's may return any item at their discretion for a full refund including shipping up to 30 days.